This simple but effective circuit can be used to control water level in a container. The prototype is used to pump water out of a bucket that collects condensation from a home air-conditioning system. The design is based around a 555 timer (IC1). Although the timer in configured as a mono-stable, it lacks the usual timing capacitor from pin 6 to ground. Instead, a metal probe inserted in the water provides a current path to a second, grounded probe. When the water level in the container reaches a third ("high") probe, the trigger input (pin 3) is pulled low, switching the 555 output high and energizing the relay via transistor Q1. Once the water level drops below the "low" probe, the threshold input (pin 6) swings high, switching the output (pin 3) low and the relay and pump off. The two 100kΩ pull-up resistors can be replaced with larger values if more sensitivity is required (eg, if the 555 doesn’t trigger). A switch (S1) can be included to bypass the relay for manual emptying. 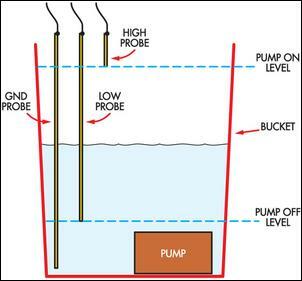 The "low" probe should be positioned so that the pump doesn’t run dry. The high level probe is placed at the level that you want the pump to start. Since the water is held at ground potential, you must use stainless steel or copper wire to slow corrosion. With water fountain pumps available for less than $10, this circuit offers a cheap alternative for those who have an air-conditioner on an internal wall and don’t want to be continually emptying the bucket on humid days.